Fresh off a review of the Fischer Audio FA-002W series I managed to get my hands on the Jubilate wooden series which retails at $180 which is almost half the price of the FA-002W. 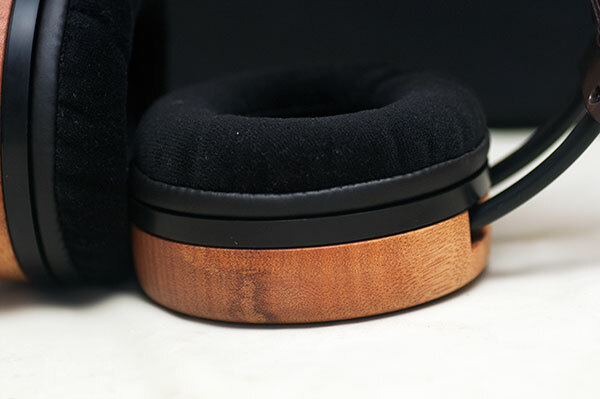 I am a complete sucker for finely crafted wooden headphones and these are no different to be honest in terms of a beautiful cup finish. The Jubilate is fresh out on the market and priced pretty competitively and the looks are going to turn a few heads to say the least. However this headphone is going to conjure come conceptions that are simply not true and if you don’t understand what you are buying you could end up being pretty shocked. 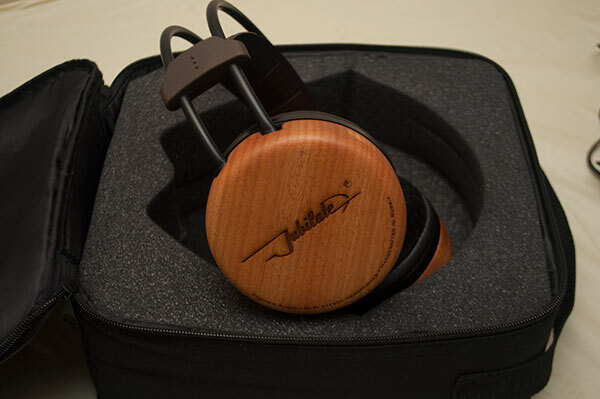 Packaged in the now familiar and highly durable stiffened nylon zip bag/box and in a ton of padding the Jubilate cuts a strident post with its wooden shine and 3D wing system headband which brandishes the already familiar Master Series headphones branding and logo. The cable is single entry this time instead of dual entry on the FA-002W and sports a 3.5mm type termination for locking into the left cup and a more regular quarter jack termination for slotting into the amp or source of your choice. 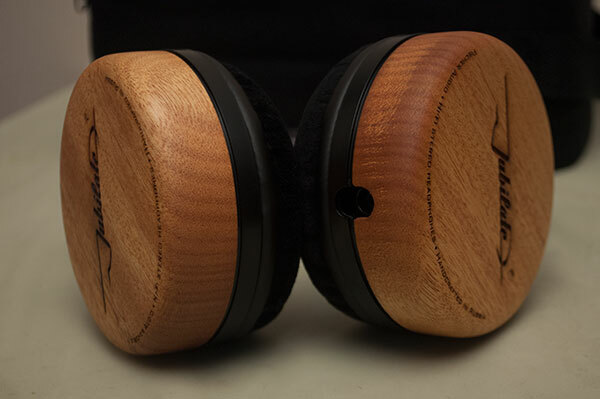 On initial sight it reminded me a touch of the e-smooth headphones with a classy shell or ATH type wooden headphone such was the familiarity when you look at the cans out of the box. True to Fischer Audio’s mantra you can of course get varying types of wooden cups such as Jatoba, Paduak, Khaya and Tiama in more circular design than the more elongated FA-002W cups. At the time of writing the price for the Jubilate doesn’t seem to vary with the style of wood used unlike the FA-002W which can vary by up to $150-$200 depending on your taste. The rest of the headphone is more standard fare brown flexible plastic hosing 3-d wing system made popular by the likes of AKG and ATH and a softer leather band across for resting on the head. In truth it is quite a comfy little setup though I wouldn’t mind the leather being a tad thicker on the band for more robustness but since this is primarily an indoors headphone I cannot see that as being a major issue. The cans also come with well crafted pleather and velour pads which are relatively easy to swap around without too much huff and puff. The color of the pleather is a nicer match than the blander velour pads so I ended up sticking with them for the review though I have some comments on the velour pads and their tonality. The pads could have maybe done with a tad more depth overall as my ear ended up touching the internal grills slightly. The main weight of the headphones are in the wooden cups themselves rather than the band so the main downward pressure is felt on the cups and ears which I would have preferred to have been more to the top of the headband itself but most 3-d wing systems I have used are generally like that – even the W3000ANV from ATH had this weight placement. It does hold fairly well in place though on your head and the sweet spot for placement is pretty easy to achieve. Isolation wise as a closed headphone is pretty decent though not earth shattering – once the music starts playing most background sounds fade away. Out of the box with velour the cans are thin, bright with grain and little or no bottom end. For some reason I had this in my mind to be another bass heavy headphone like the FA-002W. My bad, wrong expectation so after a while calming down and allowing a burn-in of a few hours I started to re-educate myself on what Fischer are trying to achieve here. This is a top down sonic presentation engineered for articulation, clarity and minute detail at a competitive price. On the velour this does not work as well as on the pleather as the pleather gives it a slightly, if much needed, darker tonality and a bit more meat on the bones in the lower end of the spectrum but not by a whole lot. The velour pads do away with the snap and give a slightly smoother response but also slim out the bass impact and emphasize the trebles a bit more than the pleathers giving it quite a bright signature. There is not a night and day difference between the two pad choices overall but my choice would be the pleathers for the added lower end depth. 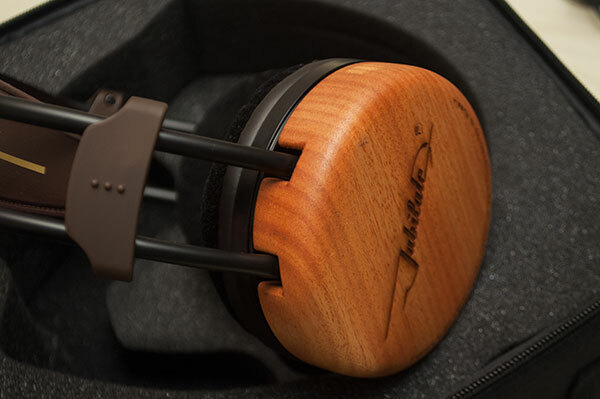 The Jubilate’s main strengths are the mids and uppers and if you are a detail freak you might feel these headphones are more suitable for you. Certainly on slower delicate tracks with acoustics and lead vocals they do portray good competence and are quite listenable. Buika’s ‘Soledad’ off her 2009 El Ultimo Drago album which really doesn’t demand anything from the lower end are a great match for them though in saying that there a tendency for a touch of sibilance to slip in now and then. So take your pick – smoothness or detail. I can handle both but only when the mood takes me. There is a certain sharpness on the tonality also that can either work well or make your hair stand on end depending on the genre. For acoustics this came out reasonably well with solid, fast almost strident articulation and a decent amount of detail. However once you threw in a lot of guitar and cymbal work such as Def Leppard’s “Animal” off Hysteria (1987) it came across as thin and sharp. I did find the sound stage to be more pleasing than the FA-002W though with its wider more forward mids section allowing a bit more space for instrumentation and vocals to breath than the more recessed bassy FA-002W. This is a very genre specific headphone and not overly musical. That is not to be harsh but consider this headphone as more analytical tool in its nature than a rocking hipster. It will dissect rather than pound the music and as such any music designed to carry a lot of lower weight and plenty of layered action in the mids and uppers might come up short. If you are going to match this headphone to an amp get a dark amp, its easy enough to drive at 106db so most warm or dark amps will work well such as the FiiO E11 or the C&C X02. 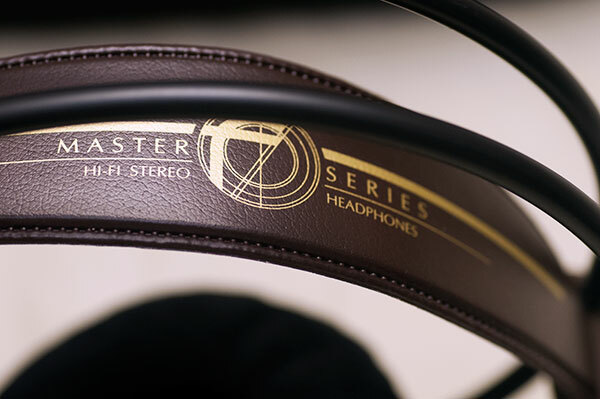 This headphone is a companion for slower moments of delicacy and detail, a headphone for more refined listening. If this is your scene, you like a touch of classy wood and your not going for top tier then you might like the Jubilate a lot actually. 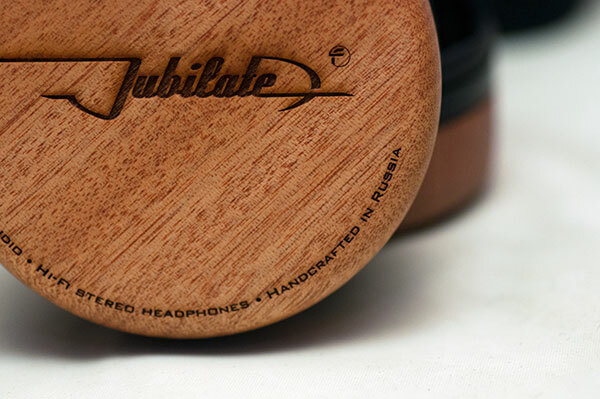 This entry was posted by Фишер Аудио in reviews and tagged headphones, Jubilate, Master Series, wood.